New article “Effects of mining on reindeer/caribou populations and indigenous livelihoods: community-based monitoring by Sami reindeer herders in Sweden and First Nations in Canada” in The Polar Journal, Volume 4, Issue 1, 2014, by Thora Martina Herrmann, Per Sandström, Karin Granqvist, Natalie D’Astous, Jonas Vannar, Hugo Asselin, Nadia Saganash, John Mameamskum, George Guanish, Jean-Baptiste Loon & Rick Cuciurean. This paper explores the effects of human disturbances associated with mine development in the Arctic on habitat and populations of reindeer/caribou (both Rangifer tarandus), and implications for reindeer husbandry and caribou hunting of indigenous Sami people in Sweden and First Nations in Canada. Through three case studies, we illustrate how Cree and Naskapi communities develop community-based geospatial information tools to collect field data on caribou migration and habitat changes, and how Sami reindeer herders use GIS to gather information about reindeer husbandry to better communicate impacts of mining on reindeer grazing areas. Findings indicate impacts on the use of disturbed habitat by reindeer/caribou, on migration routes, and northern livelihoods. The three cases present novel methods for community-based environmental monitoring, with applications in hazards mapping and denote the active engagement of indigenous communities in polar environmental assessments, generating community-oriented data for land use management decisions. They also illustrate how technology can lead to better communication and its role for empowerment. Key words: mining, disturbance, reindeer, caribou, Sami, First Nations, community-based environmental monitoring, communication, local and landscape level. 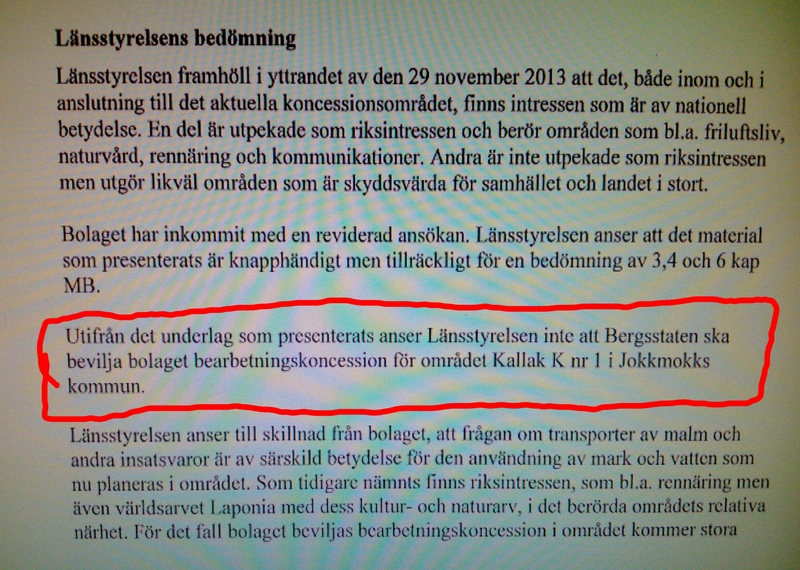 In the case for the field of research in Sweden, the two Sami villages used an abstract of the article written by me – Karin Granqvist – and Per Sandström in their overruling of Jokkmokk Iron Mines AB’s application for concession license at Kallak. 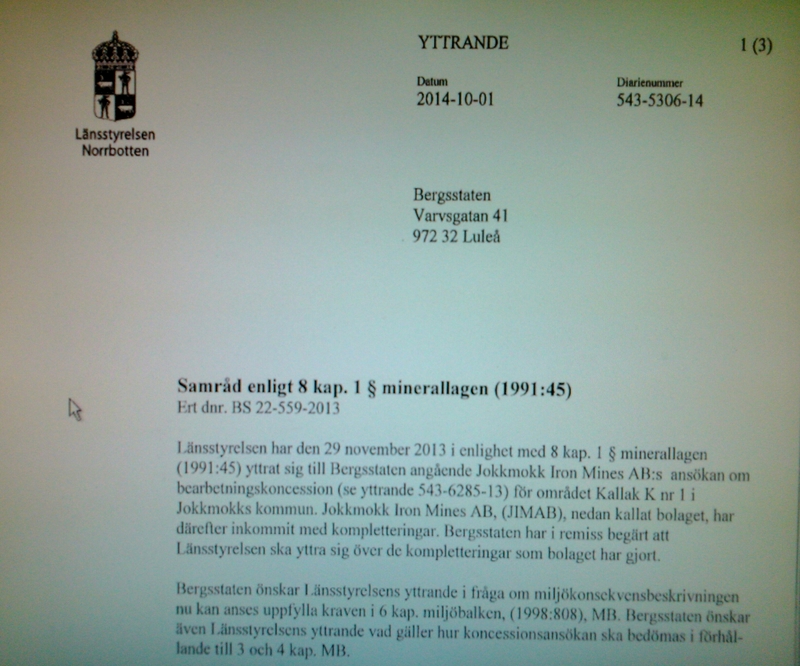 The County Administrative Board in the county of Norrbotten in Sweden, decided this October not to give JIMAB permission to exploit for ore at Kallak. JIMAB has now to overrule that decision to the Swedish Government if the company wants a concession license, but even so their application can be turned down. This entry was posted in All, Extractive Industries, Fennoscandia, Fieldwork, Indigenous Peoples, North American North, Publications, Sámi, Theoretical Issues. Bookmark the permalink.